Below is the year of President Paul Szabo, 2014-2015. If you would like to go in chronological order, start at the bottom and scroll your way up. 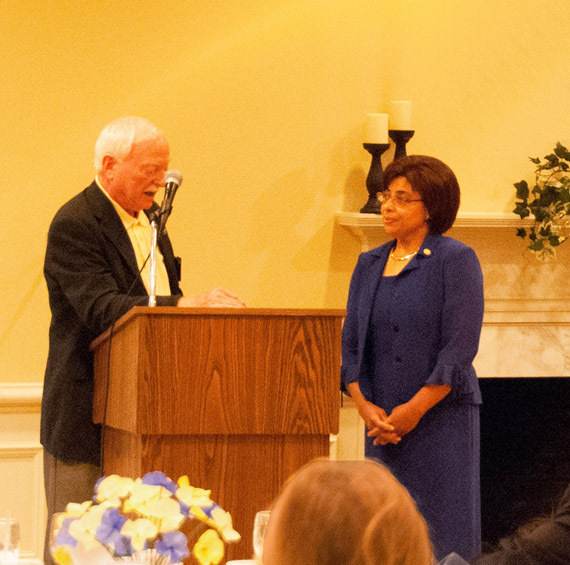 Pat Resto, 41st President of the Virginia Peninsula Rotary Club, is sworn in by Gary Chenault, who in a few days will be our District Governor. 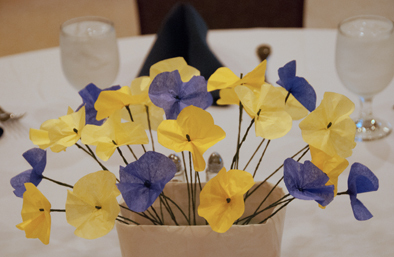 At each table at the new officers' induction party, there was a container of handmade flowers in the Rotary colors. All these flowers were made by Suki Pierce. 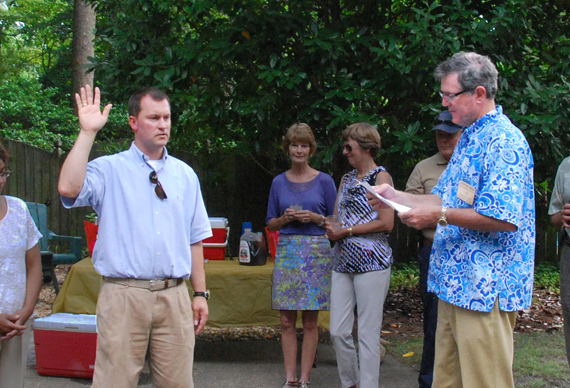 The party for the induction of the 2015-2016 officers was held June 27th at the Williamsburg Golf Club. 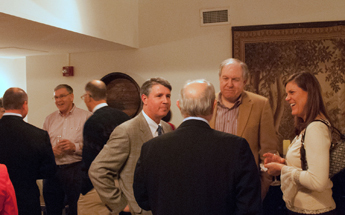 In addition to our members, the event was attended by many Past District Governors. 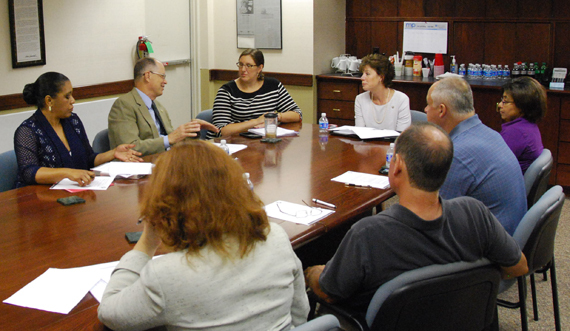 On the morning of June 24th, members of the Peninsula Rotary Board of Directors met with staff of An Achievable Dream to talk about how the two organizations would work together at the next Tennis Ball. 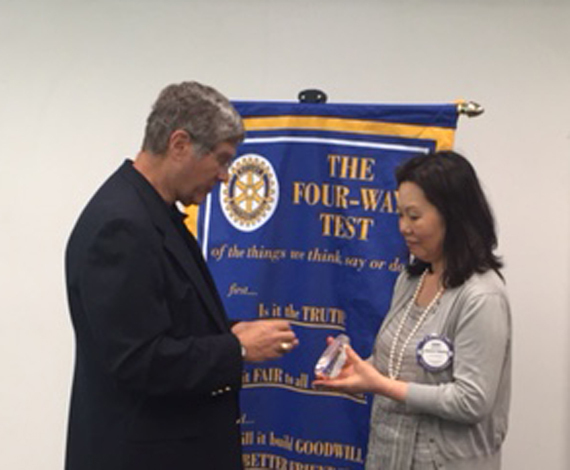 On June 17th Past District Governor Jim Probsdorfer visited the club to present Suki Pierce with a crystal from The Rotary Foundation. The crystal was in recognition of the extraordinary service to Rotary and the Rotary Foundation given by Jim and Suki Pierce. 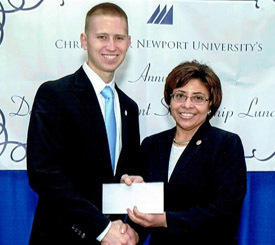 The photos above were taken at the annual scholarship luncheon at Christopher Newport University. On the left is Paul Trible with President-elect Pat, and on the right is this past year's scholarship recipient, Andrew Elgin, with President-Elect Pat. 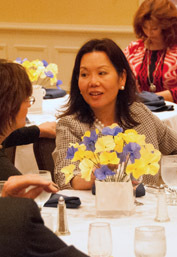 The scholarship comes from the proceeds of the Peninsula Rotary Club Endowed Scholarship Fund. 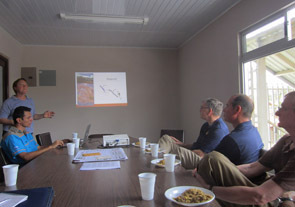 On our recent Costa Rica trip: On the left, we learn about the needs of an irrigation system serving small farmers. On the right, Danny Carroll greets a young burn victim at the National Children's Hospital. For more photographs, visit our Photo Albums page. 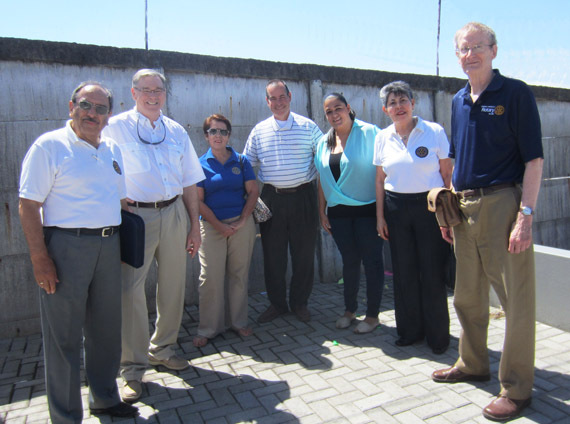 In early May we visited the Heredia Rotary Club in Costa Rica and looked at five possible projects. We were looking for a partner club in Costa Rica, and we were looking for our next project. We may have found both. This photograph shows the cross-generational character of our club's activity. 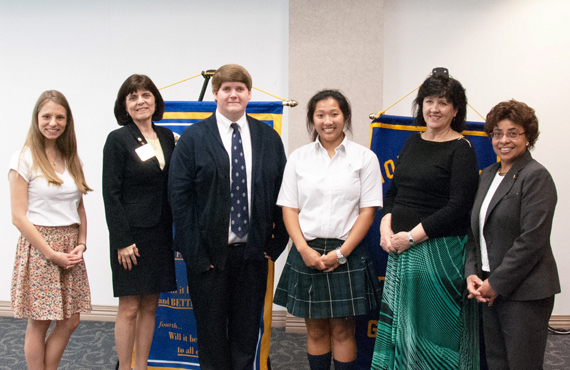 From left is Rachel Hildebrand, president of our Rotaract Club at Christopher Newport University, District Governor-Nominee Diane Hagemann, co-presidents Connor Burke and Terrie Dinh of the Interact Club of Peninsula Catholic High School, Linda Ellis, faculty advisor to the Interact Club, and Pat Resto, President-Elect of the Virginia Peninsula Rotary Club. 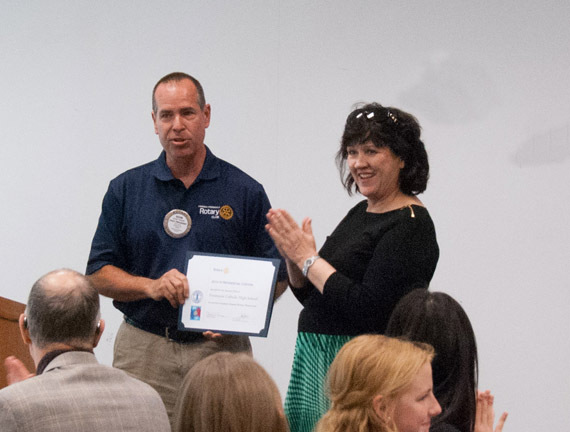 Linda Ellis, faculty advisor to the Peninsula Rotary Club's Interact Club at Peninsula Catholic High School, is shown here accepting the Interact Presidential Citation. 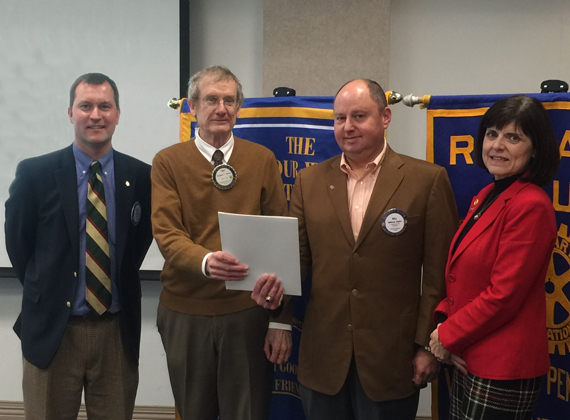 The citation is given by Rotary District 7600, which includes most of eastern Virginia. April 22nd was our annual Career Day, with students from Peninsula Catholic High School joining us--and in fact the students may have outnumbered Rotarians. It was an interchange of ideas, with much of this year's discussion centering on success in a job interview. 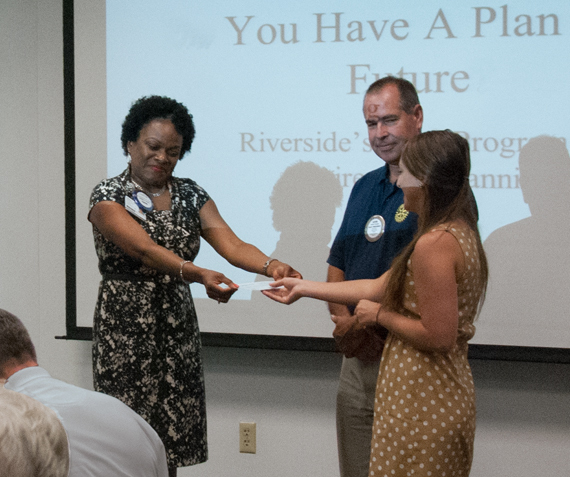 On April 7th the CNU Rotaract Club, cosponsored by the Peninsula Rotary Club, held its annual Summerville Leadership Seminar. Joe Johnson and Diane Hagemann participated on the panel, which discussed leadership and the "generation gap" from their various points of view, and engaged the audience of Christopher Newport students in a dialog. Kathleen (Kat) Briggs, of Colonial Webb Contractors, was inducted into the club as our newest member, and the fifth new member this Rotary Year. She is shown above along with Christine Felts, her sponsor, Paul Szabo, President, and Diane Hagemann, District Governor Nominee, who did the induction. 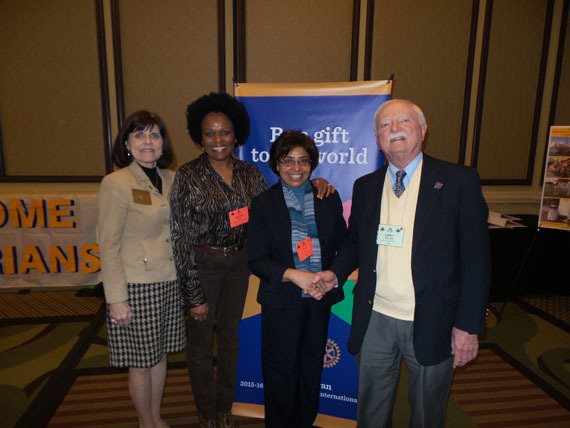 At this year's President-Elect Training Seminar (PETS), shown here are next Rotary year's District Governor-Elect Diane, next Rotary year's President-Elect Debra, next Rotary year's President Pat, and next Rotary year's District Governor Gary. 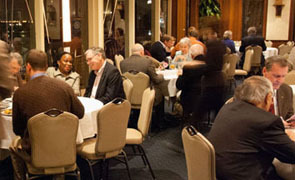 There were a number of members honored at the Charter Night celebration for increasing their Paul Harris Fellow level. 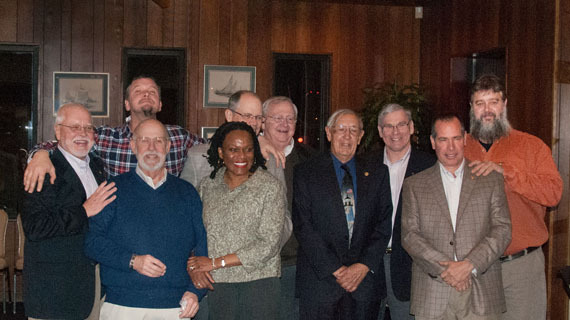 Shown here are Tom Morris Jr., Glenn Morris, Cap Neilson, Debra Flores, John Frantz, Roger Wolfe, Art Dister, Danny Carroll, Kevin Yeargin, and Tom Morris III. Members who raised their PHF levels but are not pictured are David Miller, Pat Resto, Abe Firestone, Dwight Wolf, and Joan Aaron. 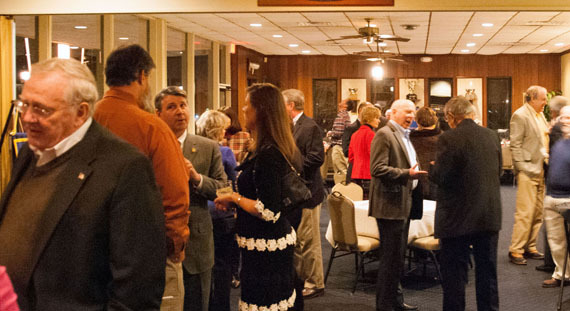 The Virginia Peninsula Rotary Club's 39th anniversary Charter Night was held Friday evening, February 20th, at the Hampton Yacht Club. 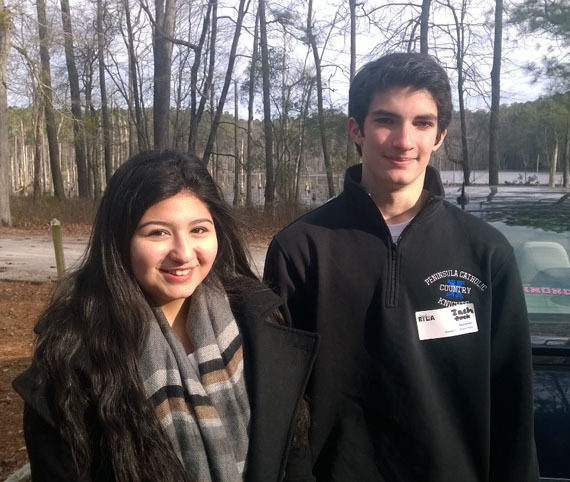 The Peninsula Rotary Club sponsored two Peninsula Catholic High School students, Lulu Elzein and Zack Abdallah, to attend RYLA--Rotary Youth Leadership Awards. This is a three-day event held in a rural setting in Sussex County, with activities that develop leadership, communication skills, problem solving, and citizenship. A Club Assembly can be a routine event, occasionally not very exciting. 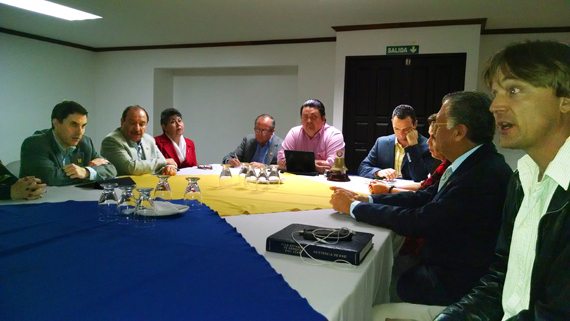 The Club Assembly January 28 did not resemble a normal one. The presentation of the 2015-2016 slate of officers and directors, the photograph immediately above, was not too unusual. But at the same meeting Suki Pierce, wife of the late Jim Pierce, was brought into the club as an honorary member, in recognition of her and Jim's extraordinary work for the benefit of our club and of Rotary. 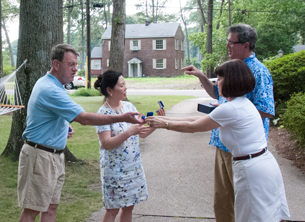 To see this ceremony, and in appreciation of Suki and Jim, this Club Assembly was attended by the largest collection by far of Rotary elite ever to grace a meeting of the club. 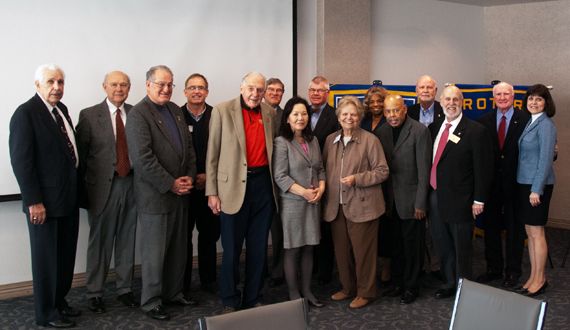 In addition to our District Governor Nominee, there were four Past District Governors from different Rotary districts, and no less than ten Past District Governors of District 7600. The photo at the top of this collection is Suki surrounded by this stellar group of well-wishers. 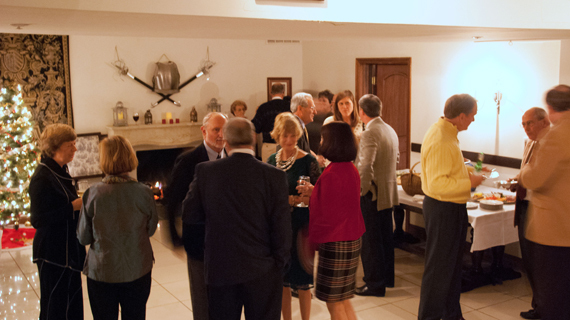 The site of our annual holiday party was the Williamsburg Winery. There was fellowship, good food, good beverages, Christmas trimmings, and a real fire. 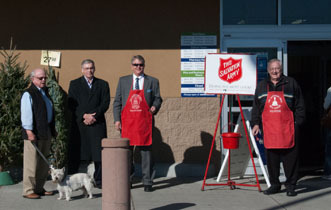 Once again at our annual day of bell-ringing for The Salvation Army, we manned two stations. This time it was at Sam's Club in Newport News, and at the Wallmart in Hampton. In the left photo, at Sam's Club, are Tom Hunnicutt, MacDuff, Danny Carroll, Rob Carmines, and Roger Wolfe. Shown at Wallmart's are Larry Mercado and Diana Gulatta. 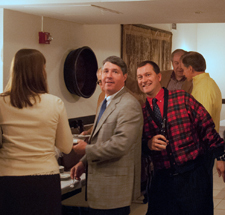 Our newest member is Bill Ziglar, of Chesapeake Masonry Corporation, inducted into the club on December 10th. Above are President Paul Szabo, sponsor Ray Spencer, Bill, and District Governor Nominee Diane Hagemann, who presided at the ceremony. 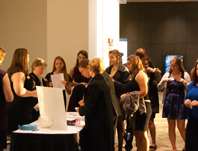 The 21st annual Tennis Ball was held Saturday night, November 15th. 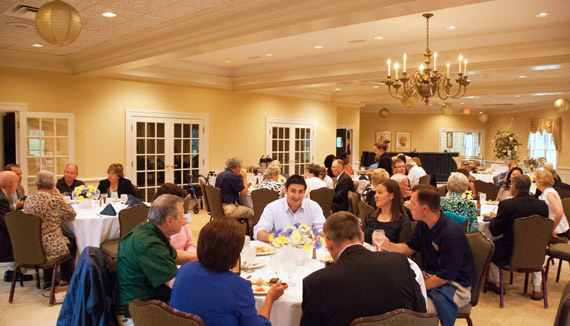 The tennis Ball, co-sponsored by the Virginia Peninsula Rotary Club, is one of the largest charity fund-raising events in Virginia, and is for the benefit of An Achievable Dream, a nationally-acclaimed school program for at-risk children. From the above photographs of the silent auction room and the dining room, you can see that the attendance, around 800, continues to be astonishing. The automobiles up for auction at the Tennis Ball are always items of interest. This year, as usual, they ranged from the moderately interesting and moderately priced, to the exciting and highly priced. Above is an almost-random collection of photos from the 2014 Tennis Ball. On the left, a sizable group from the CNU Rotaract Club, co-sponsored by the Peninsula Rotary Club, checks in at the volunteers' registration desk. The center photo shows Ray Spencer, who on Tennis Ball evening becomes a "worker bee" as a volunteer, and helps with check-in, auction item bagging, and check-out. 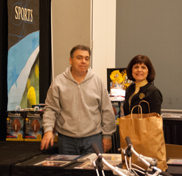 He is shown here handing the program and auction tools to a guest checking in--in this case Jim Pierce. 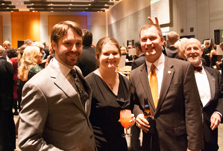 On the right in the silent auction room is Adam and Jennifer Duncan and Paul Szabo posing, while Cap Neilson hams it up behind them. On Friday, November 14th, Peninsula Rotarians participated in setting up the silent auction room for the Tennis Ball coming up the next day. 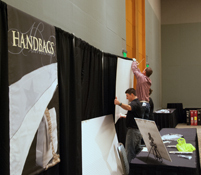 On the left, Peter Johns and Paul Szabo hang pegboard that will become part of the display of handbags. 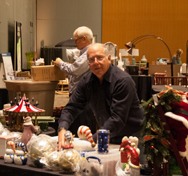 In the center, Joe Johnson and Rick Machamer are setting up the Christmas area. On the right, Diane Hagemann and her brother start putting the sports area together. 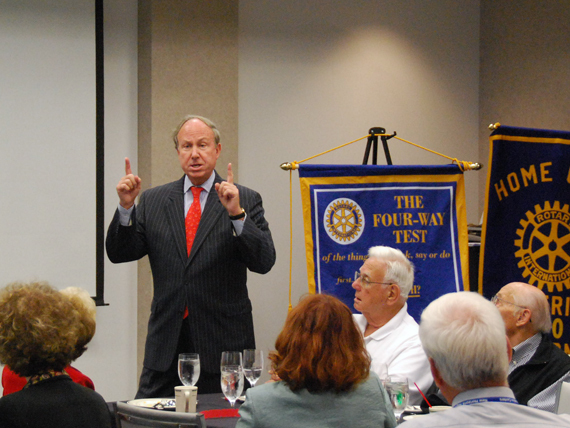 Recently the Virginia Peninsula Rotary Club has enjoyed a number of visits from prominent people in the region. 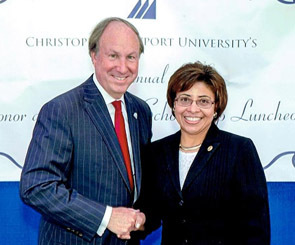 The latest was John Broderick, president of Old Dominion University. 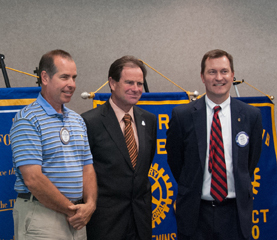 The photo on the left shows Kevin Yeargin, who arranged the visit, John Broderick, and Club president Paul Szabo. On the right, Mr. Broderick is explaining, and giving evidence that, ODU is a better school and more prominent nationally that most people in the local area are aware. 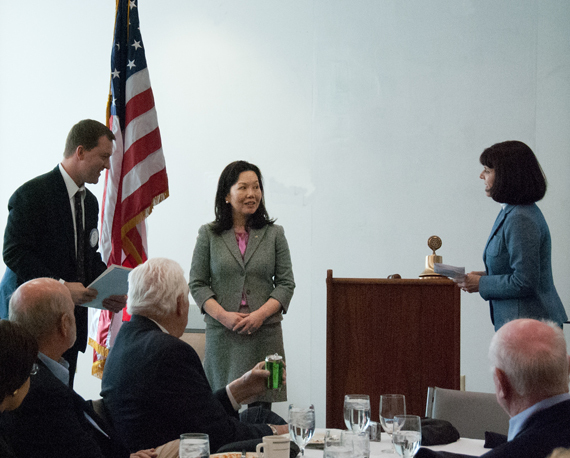 During the October 29th meeting we welcomed our newest member. 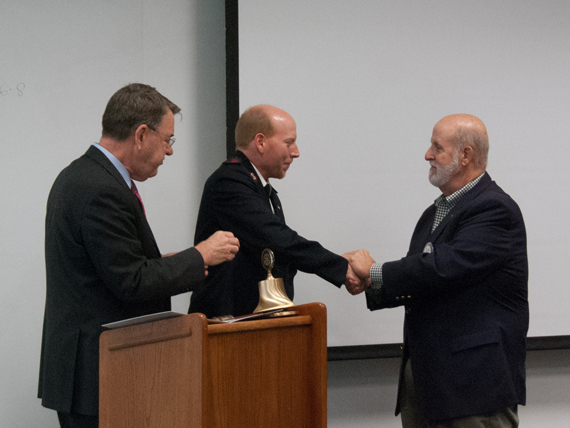 Two Past District Governors teamed up to induct Captain Ryan Brown of The Salvation Army into the club--Jim Pierce on the left presided over the (informal) ceremony, and Cap Neilson on the right was the sponsoring member. 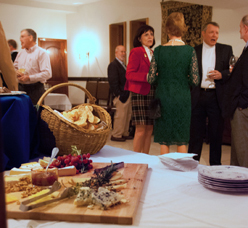 CNU President Paul Trible paid us another visit October 15th. 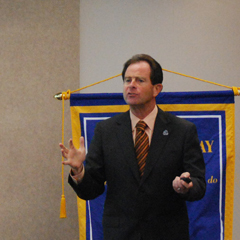 His wide-ranging presentation covered everything from the physical campus to the university's endowment, but emphasized how the school is growing in quality without growing in the number of students. On Saturday, October 4th, three local Rotary clubs--the Peninsula Club, the Warwick Club, and the Hampton Club--held a "Rotary Day" at two local Farm Fresh grocery stores. 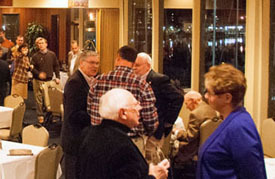 The purpose of the event was twofold: first, to gather non-perishable foods and monetary donations for the Peninsula Food Bank; and second, to promote Rotary and help explain what it is. The Farm Fresh staff and management partnered with us, doing much of the logistics and encouraging customer participation. Shown above are Kevin Yeargin, who took the last shift at the Hampton location, and Paul Szabo (giving a handout to a customer), who was taking the last shift at the Newport News location. A Rotarian and our display were the first things that customers saw when they entered these two stores. 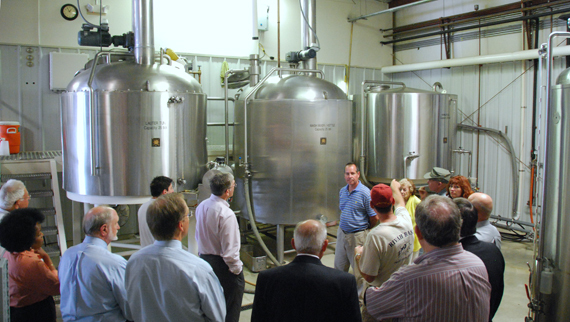 For our first meeting in October we toured St. George's Brewery in Hampton. We learned about the equipment, the raw materials, and the processes. We also had a chance to taste the various beers and ales made there, and even two lemonades. In this photo is Bill Spence, president and owner, explaining some of the equipment to the club. 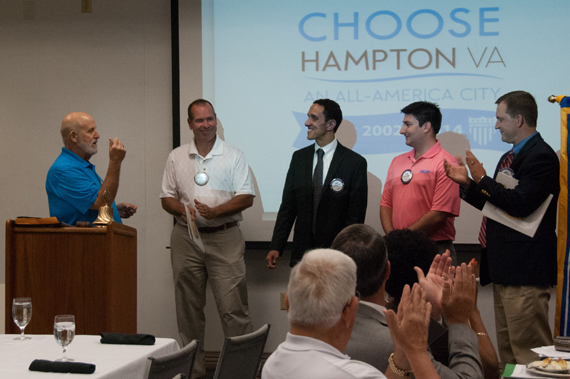 Another event happening on August 27th was the induction into the club of our two newest members, Larry Mercado and Peter Johns. They are shown here with Cap Neilson presiding over the ceremony, and Kevin Yeargin and Paul Szabo, the new members' sponsors. On August 27th we presented a big check--$12,000 big--to the Star Achievers Academy YMCA. Star Achievers Academy is a branch of the YMCA that works within Cooper Elementary Magnet School for Technology as a catylist to bring more community and business resources to the educational program.? 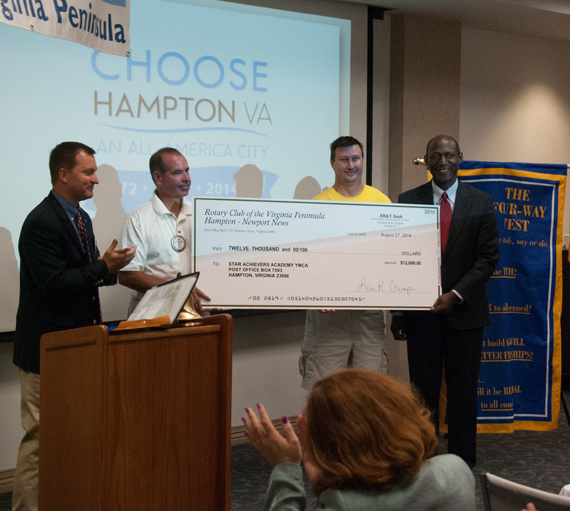 Shown here accepting the check are Sean Holleran, Principal at Cooper, and Hank Lewis, chairman of the Star Achievers board. 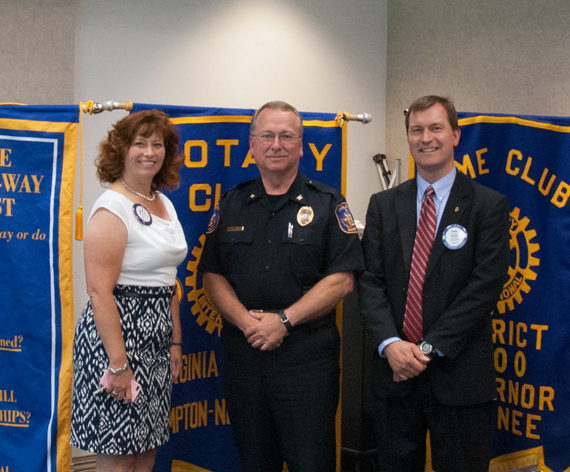 Terry Sult, Chief of Police for the City of Hampton, was our speaker on August 20th. 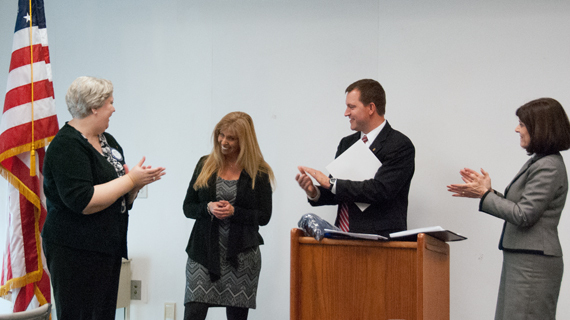 Shown here is Chief Sult in the center with President Paul and Diana Gulotta, who arranged his visit. 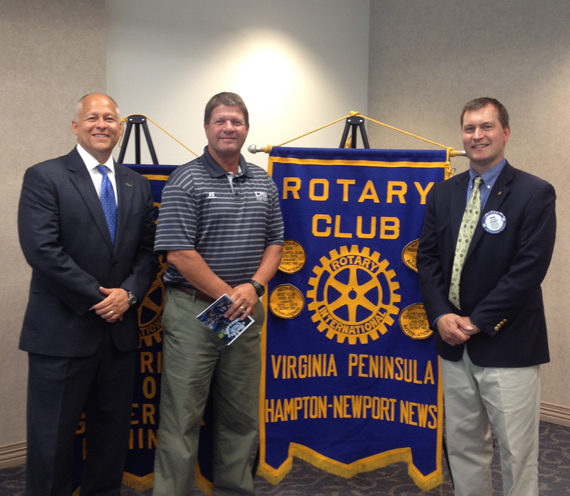 On August 6th we heard from Matt Kelchner, head football coach of the CNU Captains. In this photo Coach Kelchner is in the center, on the right is President Paul, and on the left is Jeff Clemons, who persuaded Coach K. to come talk to us. 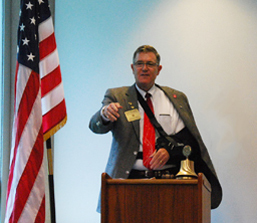 July 30th was the official club visit from the 2014-2015 District Governor, Stephen Beer. While he was here he gave Debra Flores double recognition--she has achieved the "Plus Four" level of Paul Harris Fellow, and she has become a member of the Paul Harris Society. 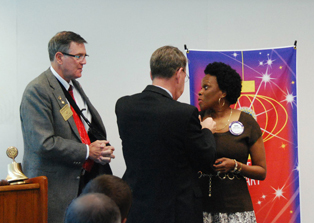 Those in the Paul Harris Society pledge to donate at least $1,000 yearly to the Rotary Foundation Annual Fund. In the photo above Jim Pierce assists the temporarily one-armed DG Stephen by pinning Debra. At the July 23rd meeting, Debra Flores presented a check for $1,000 to Brittany Sain, Relay for Life Specialist for the American Cancer Society in Hampton. Debra, Vice Presidant of our club and not coincidentally the Honorary Chair of the Hampton Relay for Life, had made a $500 donation, which was then matched by the club. 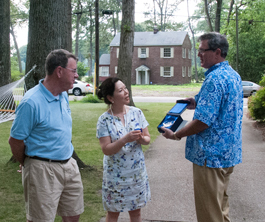 The Peninsula Rotary Club recently participated in the Hampton Relay for Life. 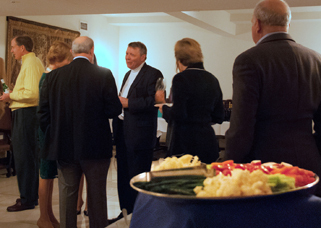 In this photograph, then-President Kevin Yeargin looks on. 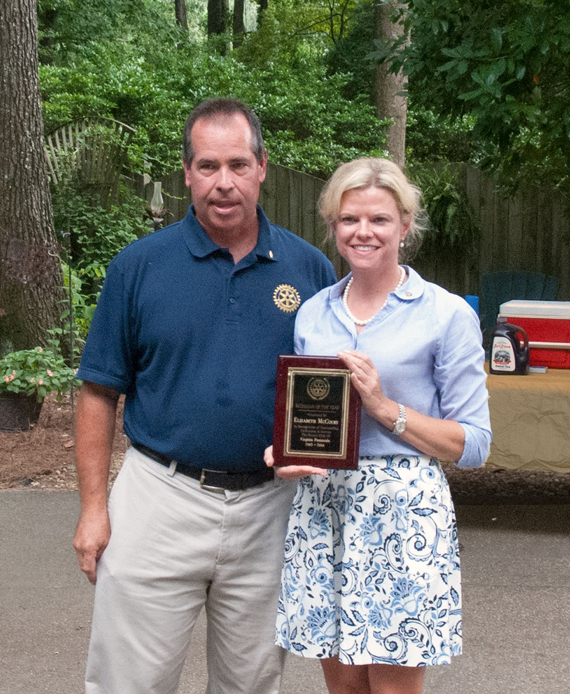 At the installation of officers party, Kevin Yeargin, outgoing President, recognized Elizabeth McCoury as the Rotarian of the Year. Elizabeth has been unstinting in her support of the club and the district, in a wide variety of ways. At the installation of officers party, Stephen Beer--assisted by Diane Hagemann--also gave Jim and Suki Pierce some recognition for extraordinary personal support of the Rotary Foundation. They got pins for being Level 2 members of the Bequest Society, and then they got pins and a crystal for being Level 2 Major Donors. 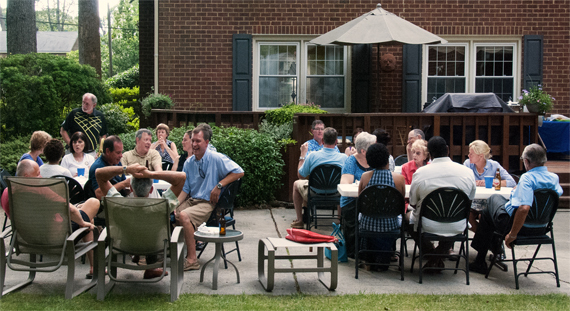 Sunday, July 13th saw the Peninsula Rotary Club's installation of officers party at the home of John and Mary Ellen Frantz. District Governor Stephen Beer first swore in Paul Szabo as the new president, and then the rest of the officers and directors were sworn in.